As you may know, many of us nerds of a feather are creative types. What you may not have known is that my co-editor Vance is the singer, songwriter and guitarist for a pretty awesome alt-folk band, Sci-Fi Romance. Even better, their lyrics and music draw heavily from science fiction and horror! So we're really excited to have two signed copies of Sci-Fi Romance's new album, Dust Among the Stars, to give to two lucky readers! The video for "Goodbye at the End of the World" is a love letter to classic science fiction and horror. In addition to trying to evoke the feel of a classic 1950s science fiction movie, with flying saucers and an unlikely couple as the only ones who can stop some terrible catastrophe, there are explicit references to books, movies, people and other things hidden throughout the video. Lots, and lots of references. 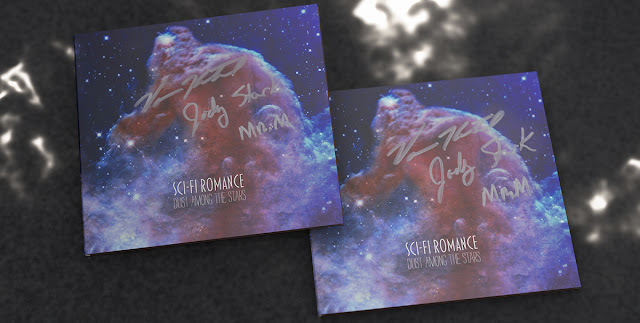 Since this is the kind of thing that is right up the alley of a lot of 'nerds of a feather, flock together' readers, the band decided to give away two autographed copies of Dust Among the Stars to our most eagle-eyed readers. Watch the video, try to spot all the references, and write them in the form below, along with your email address. In the event that more than two people spot all the references, two winners will be chosen at random from that group to receive the CDs. Reviewers are calling Dust Among the Stars a lot of very nice things, and you can hear the album here or purchase from iTunes, Amazon, Google Play, and all major digital retailers. Note: email addresses will only be used to contact you in case you win this contest. You won't be signed up for any mailing lists.